Comments: One of Soundwave’s faithful companions, Overkill transforms from dinosaur to cassette! Overkill was packaged and released with Slugfest, another dinosaur cassette figure. The G1 cassettes were a mixed bag. 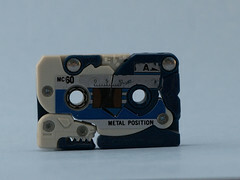 While the original four are fairly clever, in my opinion the later cassettes were less creative with the transformation. Overkill is unique in that his legs do fold out (something I realized only in the past 3 years) – so he is a little less 2D. The giant missiles on his shoulders also help to distract from the cassette markings on his side (see his cassette mode after the jump). 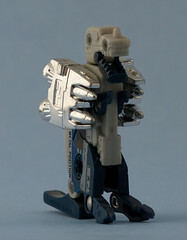 The character of Overkill has been revisited several times since G1; his most recent release was as part of the HasbroToyShop.com exclusive “Special Edition” Transformers. Here Overkill was a repaint of the classics Grimlock mold, and he came in a fancy box!